Detailed 3D visual simulations showing real-time animation of airflow and fans. Always make sure your pipes and pipe design are accurately sized and rated. Useful tools to estimate the most efficient airway size that’s is suited for your specific mine needs. 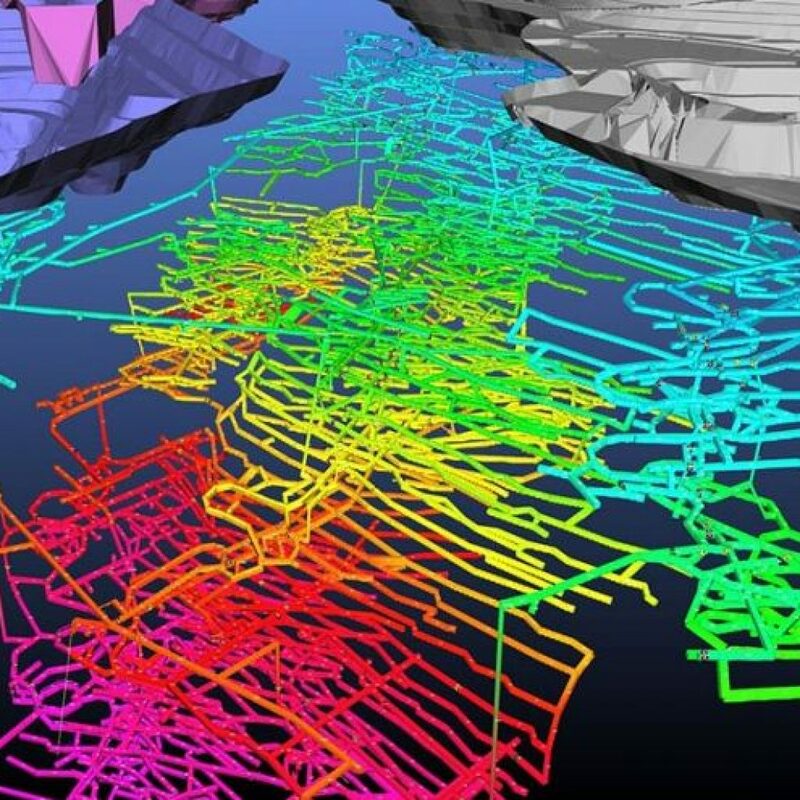 Featuring a full 3D visual interface with real-time animation of airflow and ventilation controls – VentSim is a mine ventilation modelling and simulation application that helps you visually design, improve and optimise underground mine ventilation systems. It accurately simulates airflow, contaminant dispersion, thermodynamic heat and moisture in order to discover potential errors and areas for improvement. Integrated financial evaluation functions are also available for analysis of capital and operating costs of ventilation systems. Its simulation performance is like none other with algorithms, memory management, parallel processing and a wide range of tools for heat, moisture and airflow. VentSim™ Standard is a low cost version based on incompressible flow simulation routines and includes dynamic animated 3D graphics showing real airway dimensions and shapes together with animated air flows. Colours show over 30 different data types including airflow, velocities, various pressures and costs. In addition, the Standard version comes with contaminant spread routines to help predict steady state flow of gases, dust, fumes and smoke. 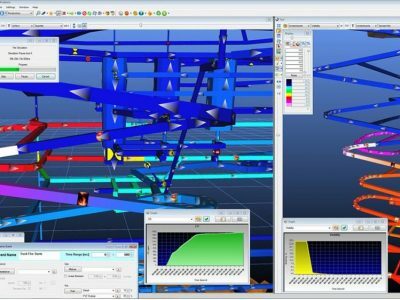 VentLog™ is a standalone software package designed to record and store an unlimited amount of surveyed underground ventilation data. 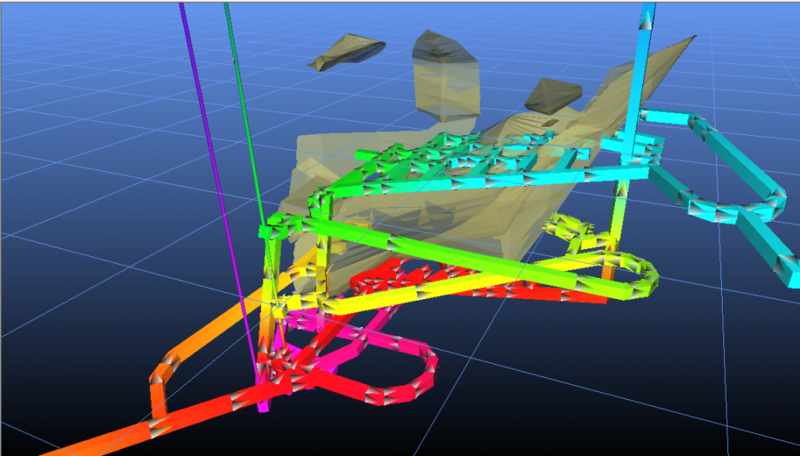 VentLog™ data can be utilised by Ventsim™ to allow recorded results to be instantly displayed and compared with modelled results within a 3D Ventsim™ model. 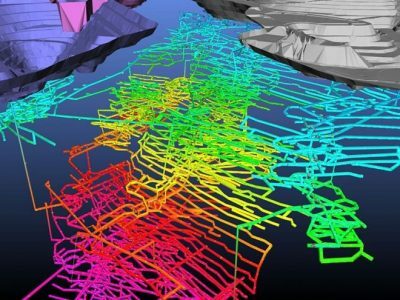 It is primarily designed to replace old Excel spreadsheets or other inefficient methods commonly used to record underground ventilation surveys. VentLog™ accepts a wide variety of ventilation data such as air flows and velocities, temperatures, pressures, PQ surveys and gases. The data is stored in an industry standard database format file (which can be integrated or analysed by other systems). Ventilation data can be instantly recalled for any underground location at any time or date. Ventilation survey forms an important part of a ventilation management plan, and is usually a legal requirement for every mine – data too valuable to simply record on commonly used ad-hoc spreadsheets or databases. Predict flows and pressures as the steady state modelling shows estimated air delivery and pressures to machines and devices. Model and design performance and duty cycle time of compressors and receivers. Predict and minimise air leakage and energy losses and costs in large systems. Correctly size pipes for required flow deliveries and pressures. Interactive 3D User Interface features a hardware-accelerated 3D display and navigation in real world scale and dimensions. Animated flows and pumps helps visualise flows moving at real-time speed through models. 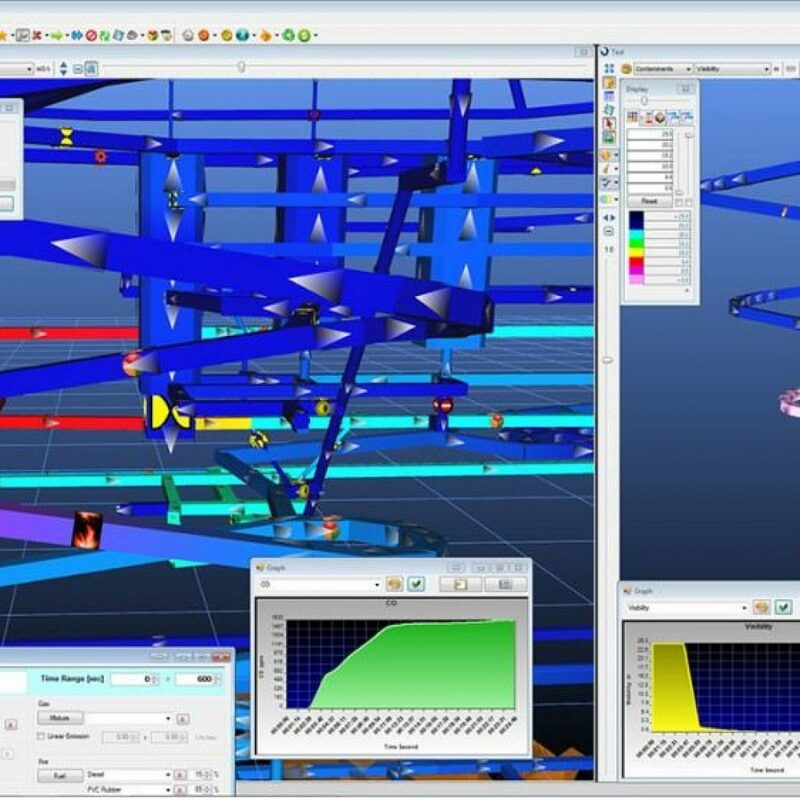 Graphics import function imports centrelines and solids from CAD packages for rapid building of Pumpsim networks. 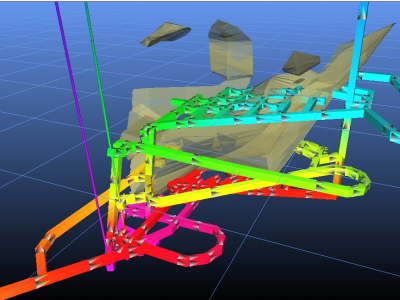 Overlay complex 3D CAD designs for further visualisation aids. Up to 10,000 network pipes enables you to build large-scale models as part of the design phase or to replicate your existing networks. LiveVIEW™ is an extension of VentSim, and provides a number of additional functions to enable the software to connect externally to data sources and display the ventilation data within the program. Examples of this may include airflows, temperatures, gases or pressures, or even machinery such as diesel or electrical equipment. It also provides an interface to simulate ventilation models using captured sensor data, offering an ability to display downstream simulated results from actual data. VentFIRE is a script building and simulation tool for modelling many types of operational and emergency scenarios. The greatest potential for loss of life in an underground mine is a fire or explosion. In an underground environment, a fire can rapidly build up a poisonous atmosphere that can quickly engulf underground personnel. Smoke can also obscure exit routes making escape and navigation more difficult. If a fire occurs, it is critical that the potential effects and spread of heat, smoke and gas is understood, and that emergency procedures are in place to ensure the safety of underground personnel. VentFIRE™ is an add-on module for VentSim™, designed to model the impact of a mine fire on the underground ventilation system. It models the heat, gases and smoke from a potential fire, and predicts the atmospheric conditions in all parts of the mine at any time during the event, including any unexpected changes that may occur such as airflow reversals or airflow choking. It also allows mines to test mitigation ideas to limit the fire impact such as opening or closing doors, or stopping and starting fans.